line you should be in. 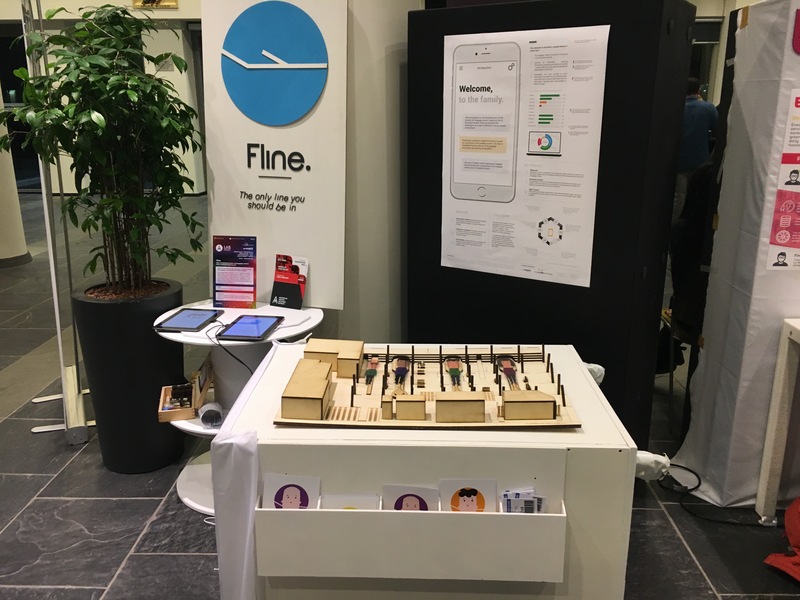 The concept Fline is bigger than just the app. The whole reclaim experience is a part of it. In order to show this we show our previous made model with the characters on the belt. The different characters should eventually represent the multicultural society that Holland has. Instead of welcoming passengers with the old windmill and cheeses, it is time for a more modern introduction. Our chatbot progressively starts to take shape but what personality should he have ? How should he introduces himself and address to passengers ? 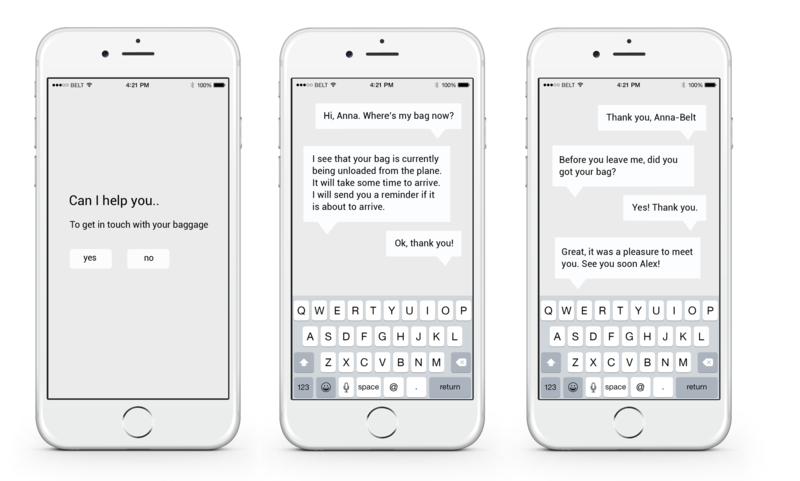 To test and improve the level of speech and the conversation flow of the chatbot we decided to led a new test with the passengers within the reclaim. 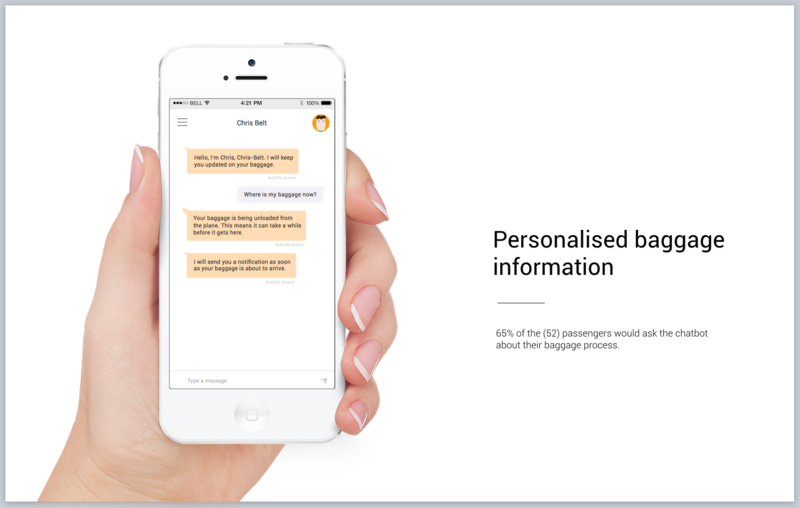 But also in order to better know, the user acceptance and evaluate if the chatbot is a sufficient trigger to motivate passengers to use it. At that point, the prototype wasn’t ready yet to be tested, so we revisited the design method of the wizard of oz. 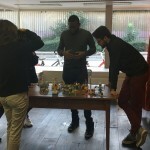 One member of the team had to mimic the bot, while another member of the team takes notes about the body language and the spatial interactions. The bot mimicry lays on one team member standing in a big speech bubble as an informative poster. The « bot » can only talks and informs by telephone using whatsapp. Marijn, internship mentor and manager at Schiphol, joined the test and helped by introducing the concept to the passengers and inviting them to participate. Despite our best smiles and all Marijn efforts, the test wasn’t really successful. Nevertheless, it brought a lot of insights. Notably, that the first touchpoint should be easy to access for the passengers and don’t ask too much effort. For example, in the test we runned, asking passengers to add a phone number in their whatsapp was a task to hard to perform for the value of the service. However, to use their own data or the wifi wasn’t seen a problem for the passengers interested by the service. Likewise, the passengers came to the “bot” before going to the belt and after getting their baggage not while waiting. Besides the test, we worked on the identity of our concept. If we had the idea of the chatbot family, the concept was missing a name embodying the service in its entirety and its future extensions. After a long brainstorm, we went for Fline. 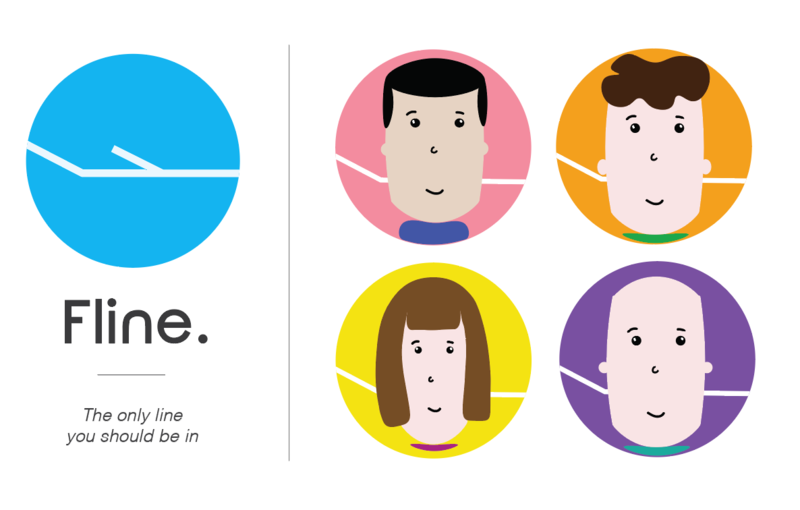 Fline, the only, line you should be in. 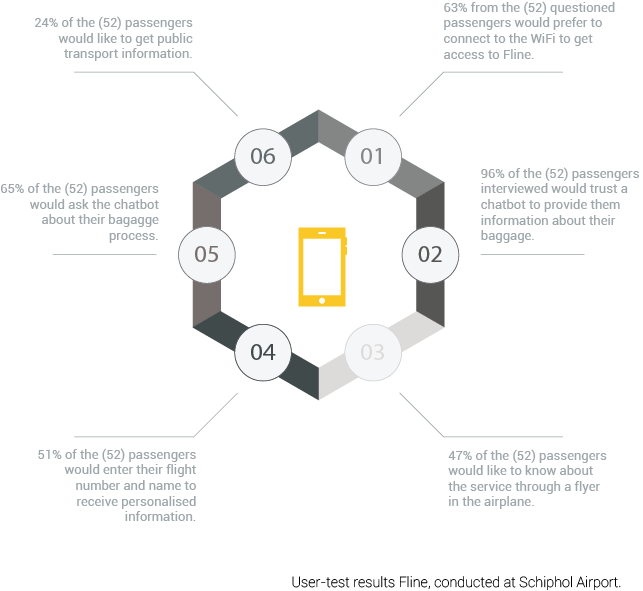 Fline is the ChatBot family of Schiphol Airport. From the landing to the arrival hall, the family Belt provides you a personalised assistance every step of your way. Stay connected with your bag thanks to real-time notifications, find the fastest way to reach the city center and discover the stories of Anna, Oddie, Chris & Henk Belt. With this concept the bag worries of the passengers are being relieved by offering them a service that provides personal information and answers to their worries. It enables the passenger to do something else other than sticking to the belt. The belts are no longer a number but a real persona/bot that has his own stories and personality. For example : Chris is for the belt number 6 and the elder son of the family Belt. Every time you come out of the plane and you put your wifi on, a pop up page appears with the possibility to use the app Fline. After uploading or scanning your ticket, one of the personal assistant of Schiphol gets in touch with you. The passenger will be introduced with the service on the plane. In the plane the passenger can take some time to enjoy the stories about the Belt family and to get to know about the baggage process. This will at first be in the form of a flyer. The flyer will be placed by the airlines in front of the seats of the passengers. When a passenger exit the plane and walks to the baggage reclaim area, he starts to think about his baggage. Whether it has arrived already, where it will arrive and if it will come at all. His bag worries start to be a part of his reclaim experience. During his walk to the reclaim area the passenger is being introduced to the concept. In the corridor the walls cover the family moments of the Belt family. Every family-member moments are being captured and shown to the public. 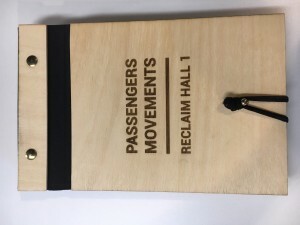 The passenger can see this and feel connected to the the family of whom one member will help him with his baggage assistance. When a passenger clicks on the travel information he gets linked to the type of travel that is most convenient for him. For instance, travelers to Amsterdam will get a link to the NS website and can manage their travel. The passenger can choose to follow the link or just go on with the conversation. The reason this information is provided is because test proved that passengers would like public transport information during their waiting time. Soon after we have conducted a field survey with arriving passengers at Schiphol Airport. The goal of the survey was to measure the user acceptance of the passengers with the app. And to see if the concept of the family was clear enough. 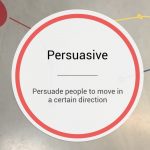 We did this by using a simple clickable prototype of the app and a digital survey on the other hand. The results to the test led us to the fact that the passengers where quite enthusiastic about the concept. Especially the element of tracking their baggage and having a sense of control. 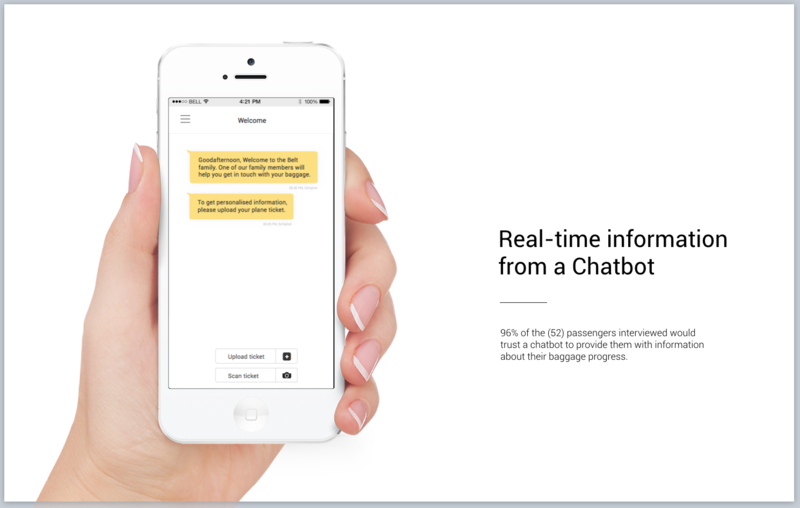 Also they would trust a chatbot to give them travel advices and information about their baggage. During the review, the concept of turning the belt into a smart chatbot was really appreciated by the assigners. Nevertheless, numbers of technical issues were raised as well as the lack of entertainment in between the notifications. The next step in our concept progress will be to make a clickable prototype taken into account the feedback we have received to make the concept more complete and test it as soon as possible. 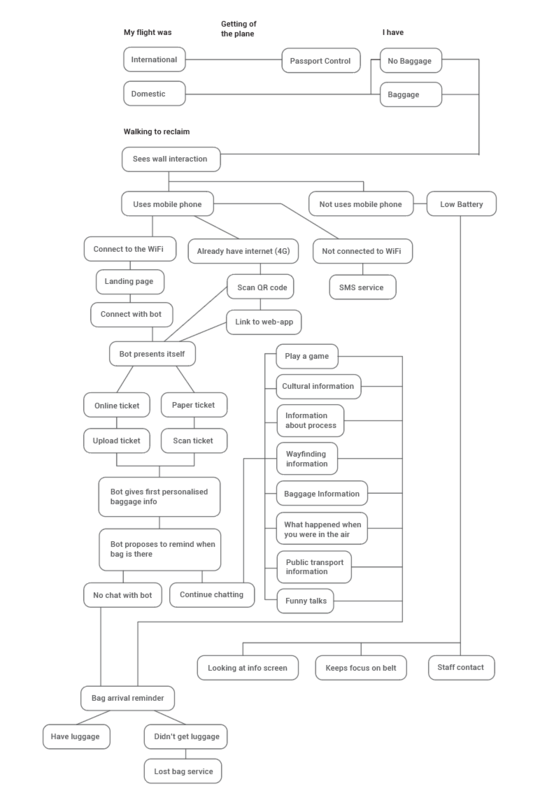 For this we first made a version 1 flowchart, to see what choices the user has to deal with and what touch-points we have to design for them. After the flowchart making it was much easier to make a mock-up for the eventual app, this made us think about the conversation the bot will have with the user. During the translation session we got the feedback that we need to think of several type of passengers the one who want efficiency and the one who want entertainment. So take those two types into mind. Create different scenarios for this group. Linked to these target groups we need to go deeper into the end-goal and motivation of the passengers. 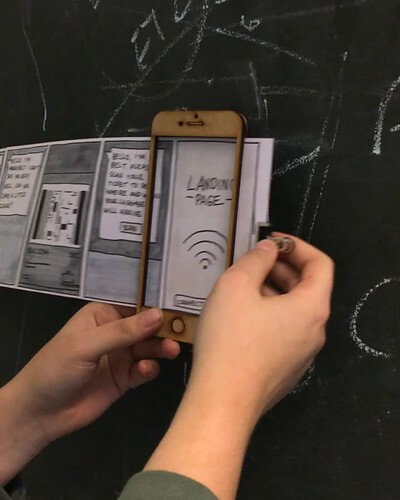 So After revising the prototype we where still uncertain about the flow of the app and the connection to the target group. For them, where does their journey begin and when has their endgoal been reached and how does our concept fit in this. To test this with the user we made a physical flowchart. 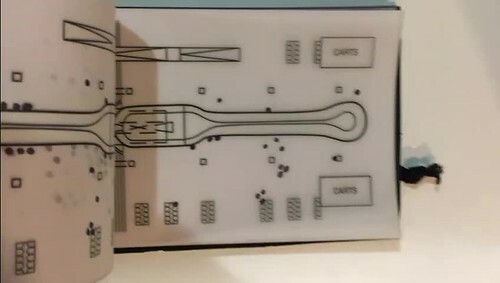 The goal of this flowchart is to see what touch-points trigger the passenger to their next one until the end goal. the white cards represent the current touch-points, while the black represents our touchpoint implementations. First we have tested it in MediaLAB with the other international students to have some first feedbacks. After this first test we have made a few adjustments in the cards and put the order in the right way. To have a better flow in the customer journey. This updated version we have test in the Schiphol Plaza. The question to the passenger was to map their ideal journey, a total of 10 passenger were willing to do this with us. The result we got out of it was that people are willing to receive a reminder that there bag is coming. For the next and last sprint we will focus on expand the whole customer journey and make it whole. Also the technicalities of the concept have to be finished. And many many more things. Where are we now? What are the facts we want to drive our concept on and how can we use them so? This was the beginning of the past few weeks. Our goal was to come up with a concept and make something! We started focussing on the core problem and the initial goal of the project which we stated was: Crowding around the belt. 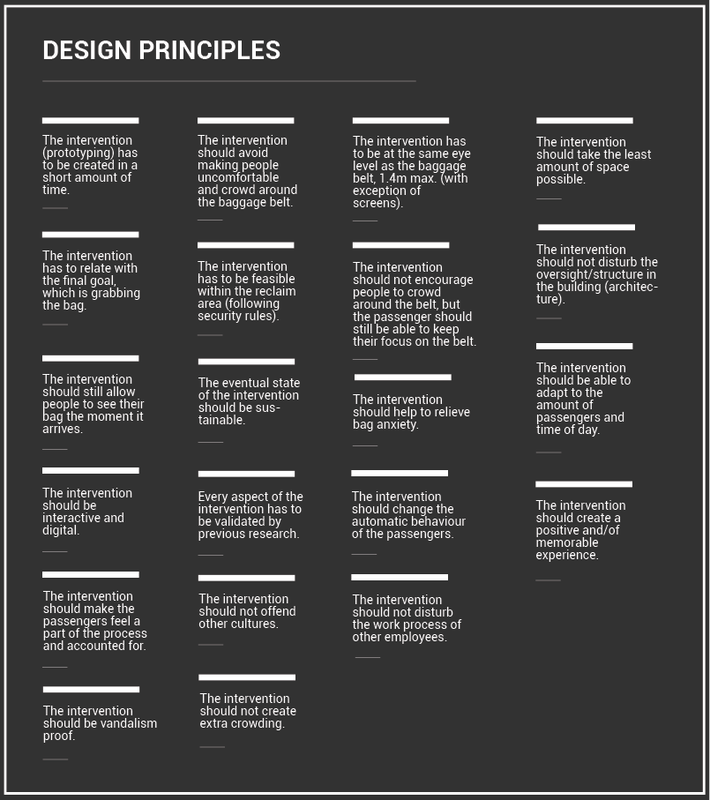 First to design a concept fitting the assigners requirements and make sure we don’t loose sight on important factors, we have made a first draft on design principles acting as a checklist to confront our concepts. 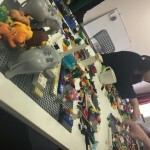 After the draft was reviewed by the assigners who had some insights from their point of view we came to a ‘final’ version. After that we went into fast forward concepting mode, a day long we brainstormed about possible solutions to decrease crowding around the belt and enhance passengers experience. 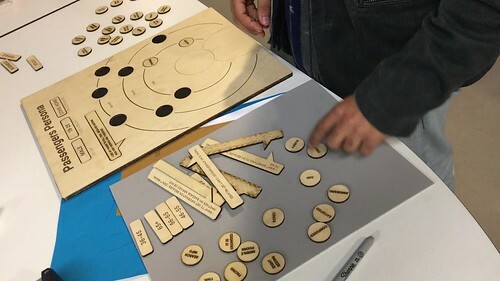 We have used dot voting to eventually compose one concept and for a persona with the persona grid that connects to the concept. We do this by guiding the passenger through different touch-points, which will be explained in the concept scenario. 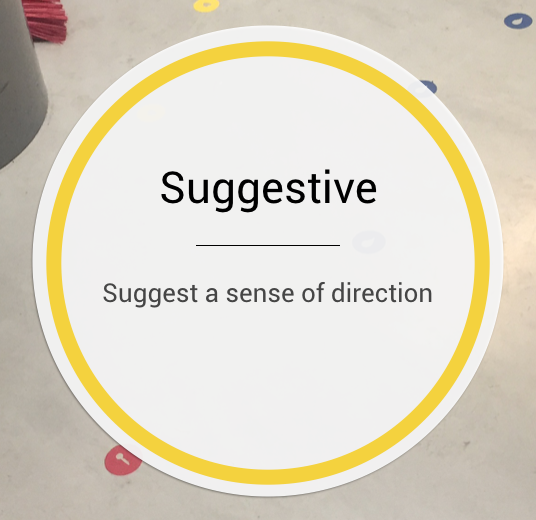 The different touchpoints have a different aim to guide the passenger. However, we realised that the passengers won’t step out of the belt if we don’t relieve their bag worries, appearing as the main passengers pain points. By giving them, the assurance that their baggage is on the process and that they would be notificated when its on the belt, it enables them to de-crowd and do valuable things. After the translate session we started to think of the feedbacks we had. One of the most valuable insight we had was the fact that the concept we came up with missed a lot of check boxes on our design principles, the main one being the fact that the service should link to the main goal of the passenger which is; grabbing their luggage. 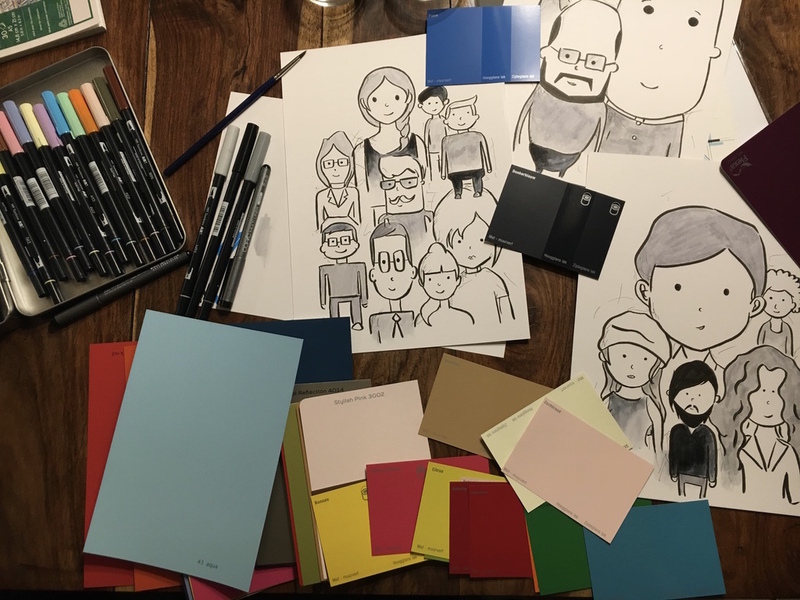 Next we started to make a tangible version of the situation. To know where we could place the service / product, which touchpoints to use and not disturb the other services working in the reclaim area. While being in the process of making the model a concept was soon coming to life. Why not anthromorphise the baggage belt? Being the link between the passenger and their baggage, the belt is a transmitter which can send and receive message to/from the passengers. So the passenger is in touch with the process, feels in control of the process and is notified when the process is almost done. 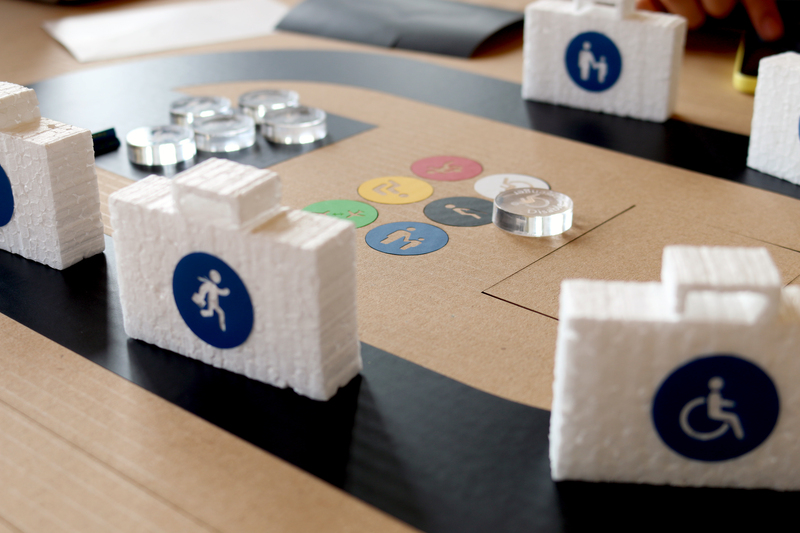 For this we made a quick prototype, since the peer pitch came closer. 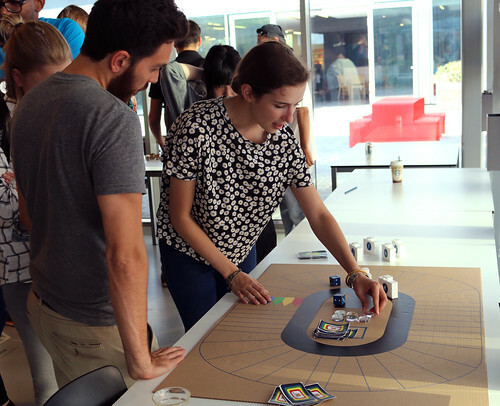 Fast prototyping to make our ideas visible in a fast way. 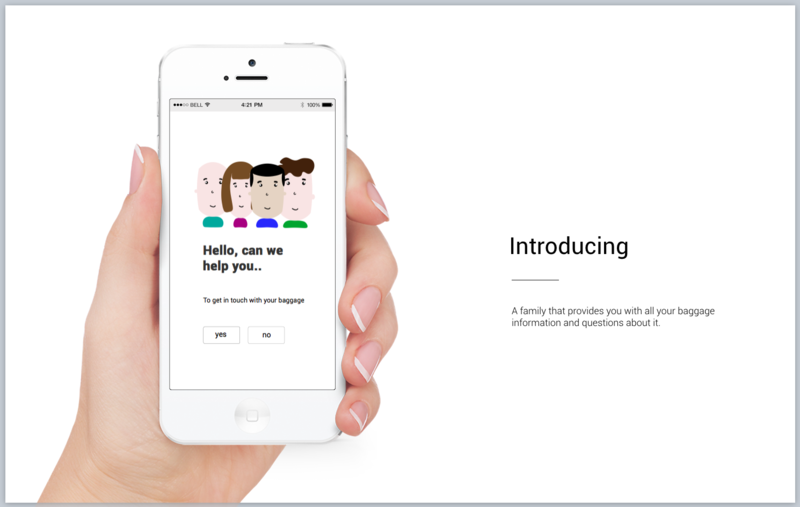 As a first touchpoint, we took the Schiphol wifi landing page through which a pop up will lead the user to our web app. 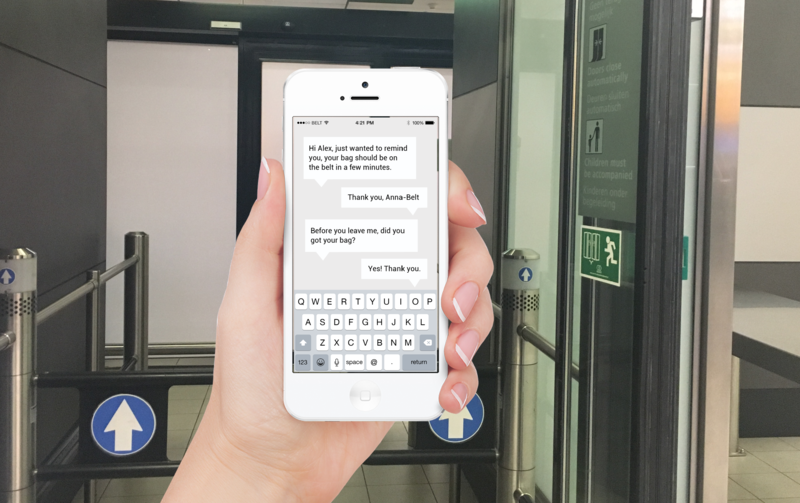 By scanning or uploading your travel ticket, the belt bot recognises you and will speak to you personally. Also, scanning the tag will enable the bot to track the passenger baggage and give him notification of his bag process. When the baggage is about to arrive in the reclaim, a notification will be send by the ChatBelt. If your baggage is not there, the chatbelt will facilitate the communication between you and the assistance for lost baggages. During the review, the concept of turning the belt into a smart chatbot was really appreciated by the assigners. Nevertheless, numbers of technical issues were raised as well as the lack of entertainment in between the notifications. 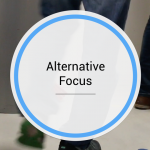 The next step in our concept progress will be to make a clickable prototype taken into account the feedback we have received to make the concept more complete and test it as soon as possible. 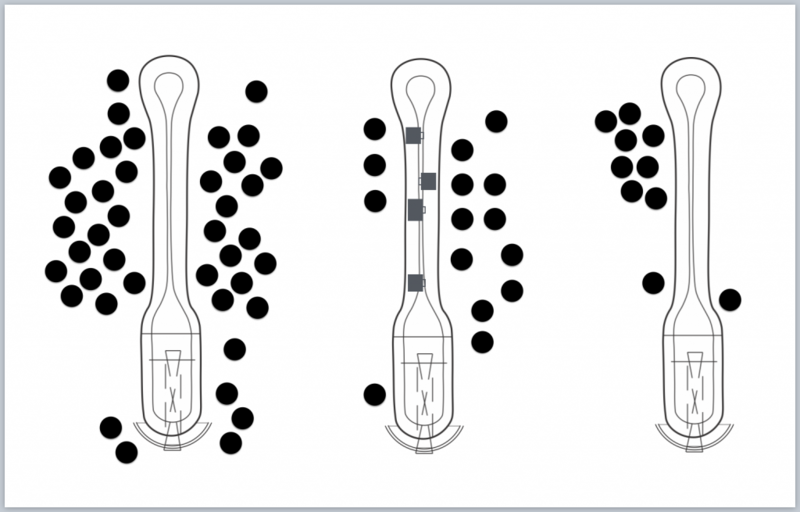 Through this observation, few behavioral patterns were underlined. The first is the fact that the passengers try to avoid the bigger crowd when they crowd around the belt. Also they tend to make micro lines as soon as the baggages arrive at the belt. We observed that when a amount of passengers have already received their baggage the remaining part, gets very anxious and start overlapping each others field of comfort. To better understand what lead individual to crowd while waiting and what this automatic behaviour triggers as emotions and feelings, we looked for previous researches on the subject. One of the main findings was that every individual has a field of comfort and a field of influence. 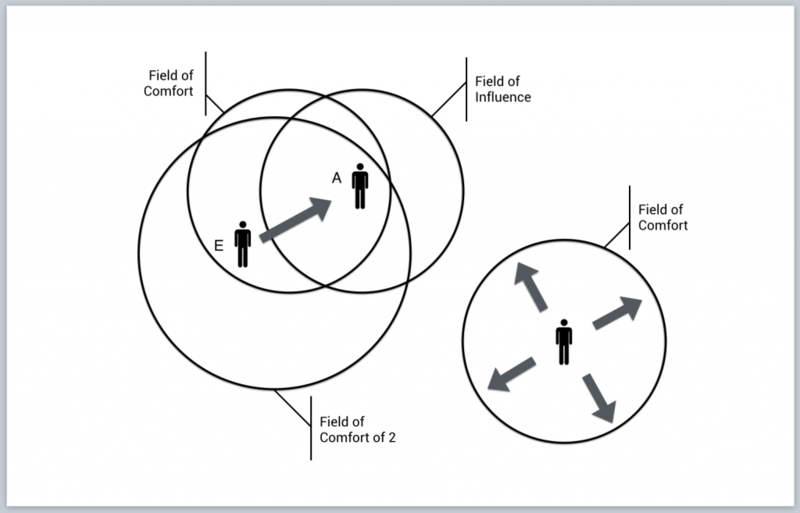 The field of influence acts like a magnetic field which attracts individual when their field of comfort overlap. If the field of comfort is independent of the field of influence of another, theres no interaction. And if to much field of comfort overlap, it creates uncomfort and anxiety. As a result of this literature review, few guidelines were used to conceptualise our design interventions. Notably, we observed the limits of the goal we wanted to achieve : decreasing the crowd. Indeed, the reclaim area is a defined space where a variable amount of passengers transit. For those reasons, we can’t decrease the crowd, we can only organise or entertain. As a follow up we did a boundary shifting exercise to come up with different angels for prototyping a solution. 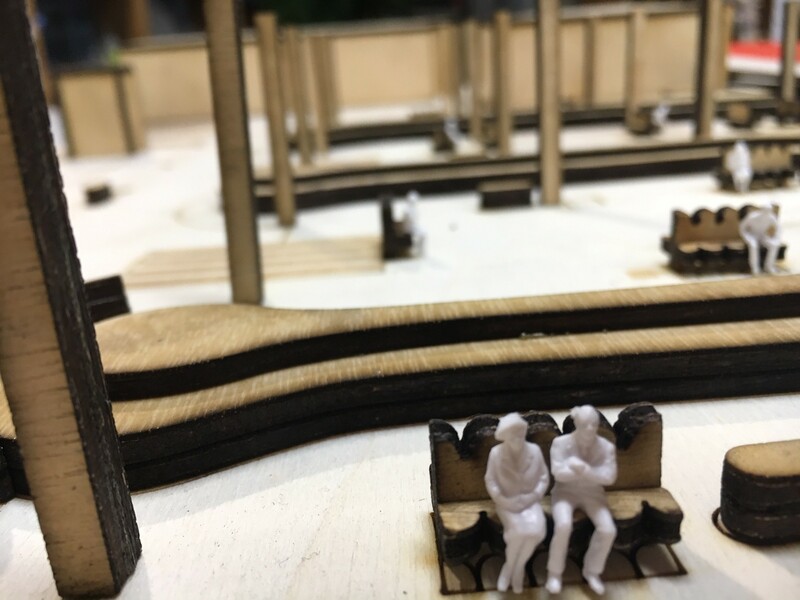 We have used the method by individually search for settings where design interventions where made to adjust the urban or personal setting of a space to enhance the experience. 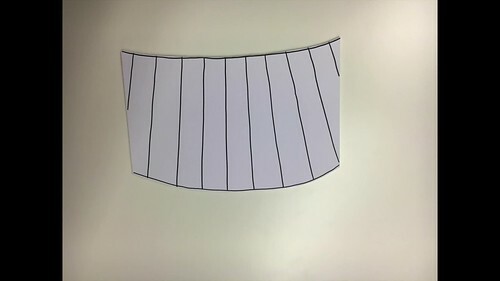 Because we can not test our ideas in the reclaim area, we first started in a smaller environment where we have observed the same situation as in the reclaim area. Which is that people crowd around their main goals, since they have no direct sense of direction. This area is the kitchen of Medialab Amsterdam which is used by different people. 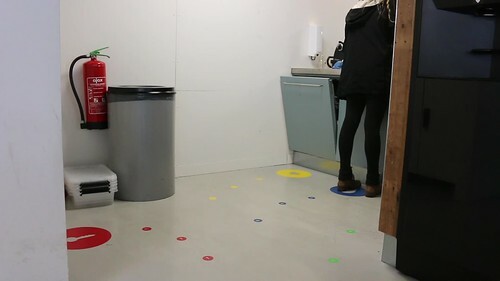 As a first prototype we tried to suggest Medialabers to follow vinyl dots we put on the floor as signage for each main point of interest (coffee machine, sink, locker and plate). 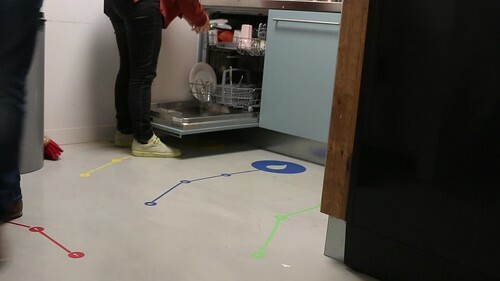 When the area was not so busy the experiment went pretty well but as soon as, the space start to be crowded or that another strong point of interest such as a grocery bag is introduced, the dot path wasn’t respected anymore. To turn this intervention into a more persuasive one, we put lines between the dots to trace a really clear path to the point of interest. We observed that the lines were too small to be considered as a path and were more considered as a corridor. 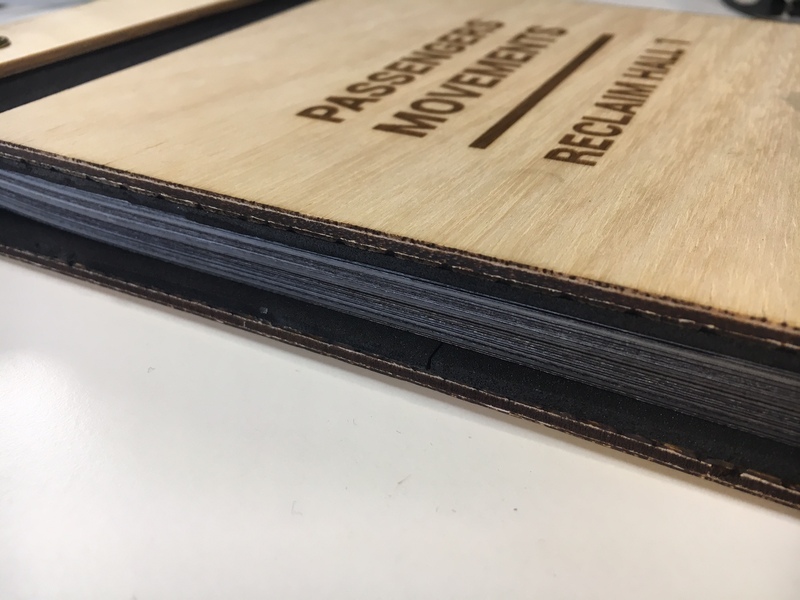 Through interviews with users, we realised that the past experiences had a big influence on individual behavior and that the intervention should be at the same eye level as the strongest point of interest, for us, the baggage belt. In the next days, we are planning to design new interventions but this time in a real scale setting, the baggage reclaim! 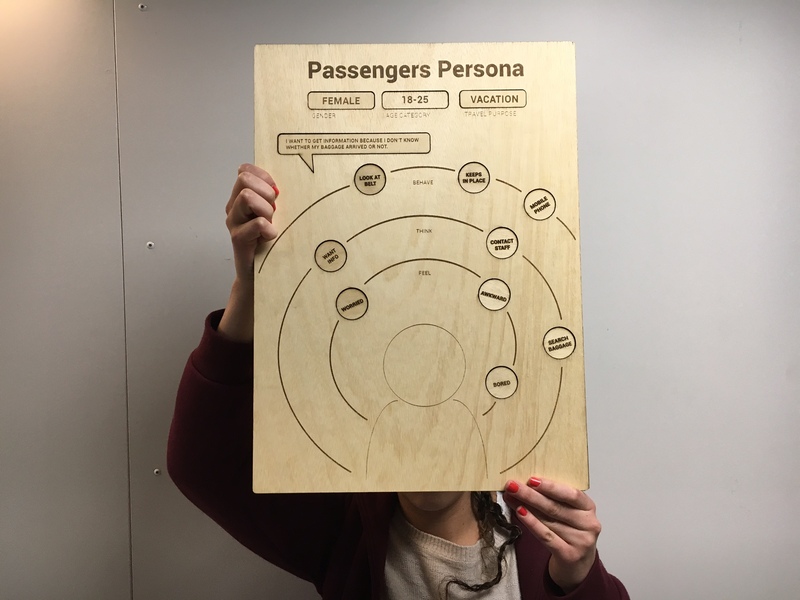 Beforehand, we will also test the concepts themselves with the help of our customizable persona and see if the intervention can have a positive impact on all kind of passengers. 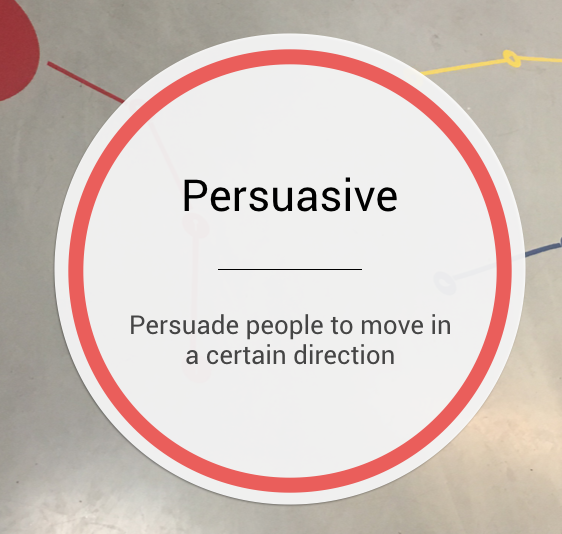 This customisable persona is based on our past desk research and validated by our target group. Verifying our persona with the target group to see if he can finds himself in the persona. After this first sprint, we were really in need to get into passengers mind and to gather meaningful insights. 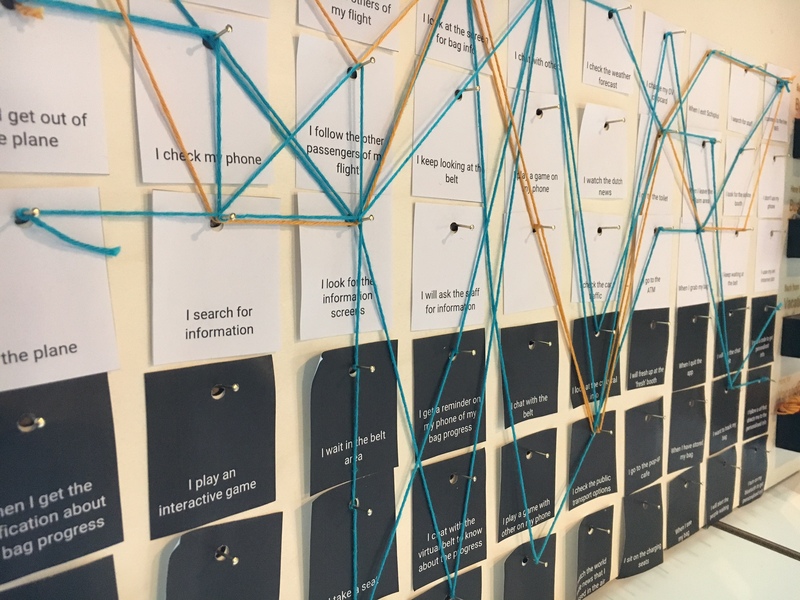 To better understand our users, we first started by mapping their concerns. With the help of an empathy map, we synthesized our observations and draw out (eventually) unexpected insights. 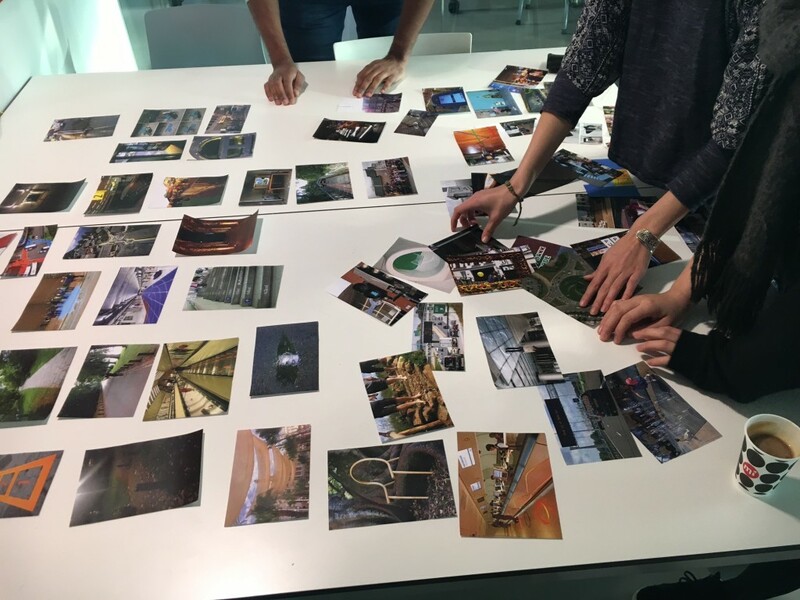 After this creative session, we felt the insights we gathered were a lot based on assumptions. Indeed thoughts, beliefs, feelings or emotions cannot be collected by observations. 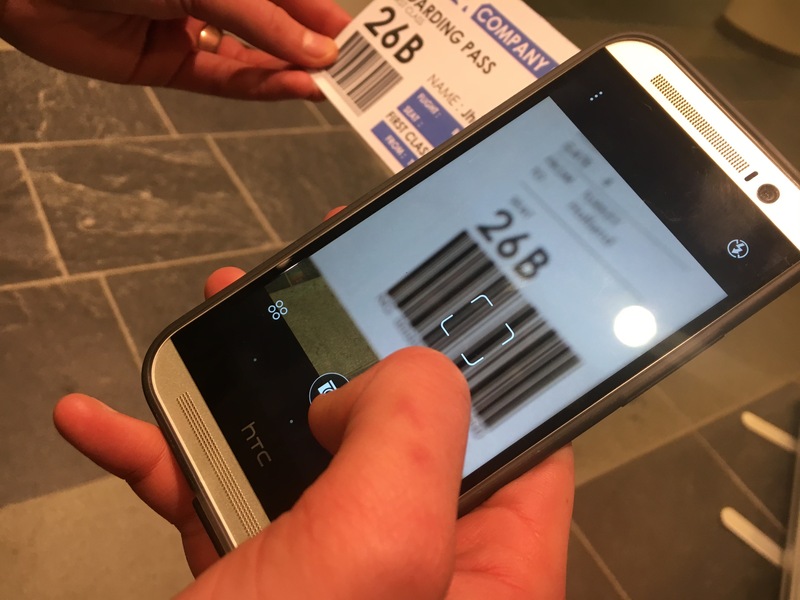 In order to gain concrete insights, we led two field surveys : one within the baggage reclaim and another outside at the Schiphol Plaza. In addition to the field researches, we also created a digital survey to reach a larger number of people and see if the temporality had an impact on the answers contents. Surprisingly people we interviewed at Schiphol tend to have an overall good experience of the baggage reclaim process that they judge fast, functionnal and efficient. However, the answers from the digital survey were more reserved and also more detailed. From this results, we understood that the passengers we interviewed in Schiphol were willing to answer as they were living a good experience. The one who were experiencing stress or anxiety probably refused. At the end of the sprint, we had a behavioral lenses session to see if we could approach the project from another angle. 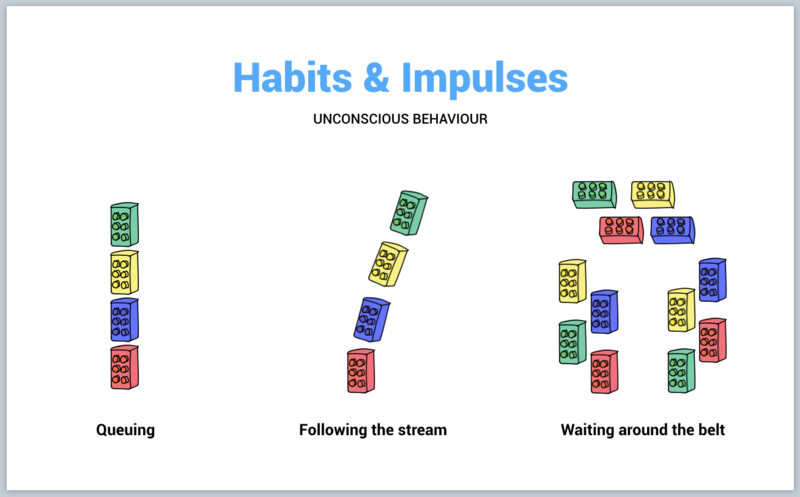 Basically there are two types of behaviour conscious and unconscious behaviour, the one we want to target on the next sprint is the unconscious behaviour of queuing, following the stream and waiting around the belt. Insight: Positive / Negative is a result and to conceptual to use as a foundation for a product or service. 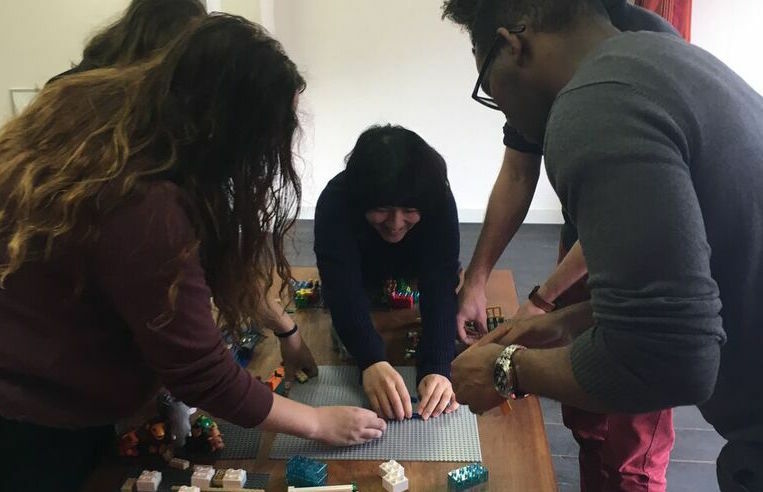 For this sprint, we had the chance to participate in a Lego Serious Play workshop held by Katinka Bergema, a design researcher from TU Delft. 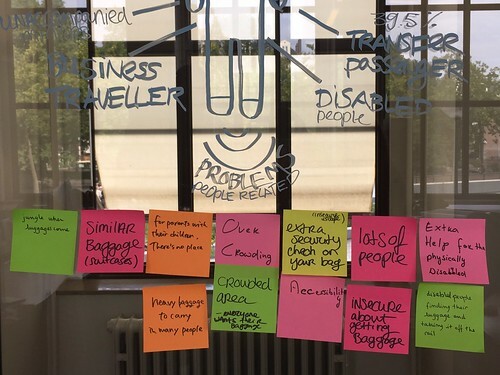 The intention of the Workshop was to make the problem around the baggage reclaim area tangible, and set out our visions separately and together. To form a whole together. To see if new ideas come to light and situations haven’t thought of yet. 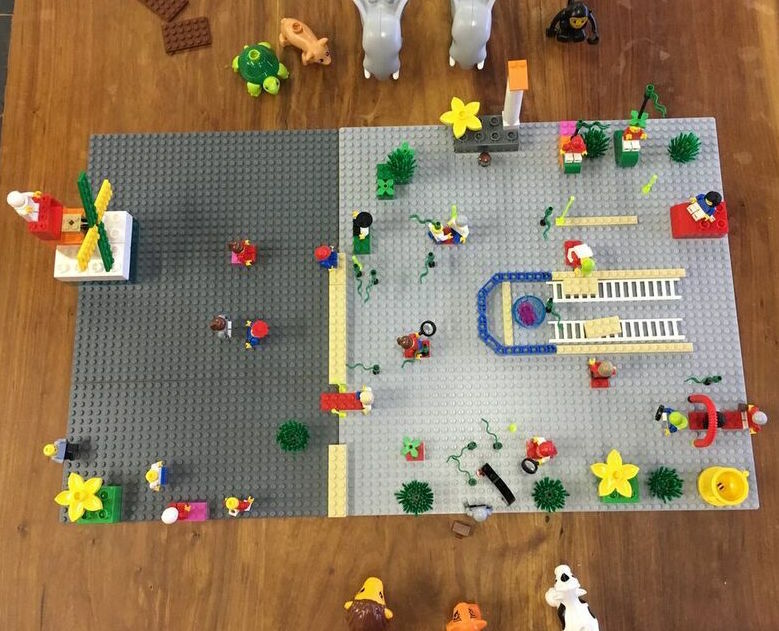 After getting to know how to work with Lego, we started by constructing individually our current vision of the baggage reclaim area. 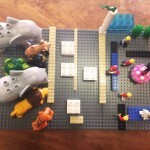 For example, Adinda put on the left side of her display animals representing passengers behaviors in the reclaim area. They are all pushing each others in order to get their baggage as fast as they can. On the right side, she made her ideal version of the reclaim area. Passengers are humans again and behaving consciously. The pink cake represents the product the team could make to enhance the passenger experience in the baggage reclaim are. 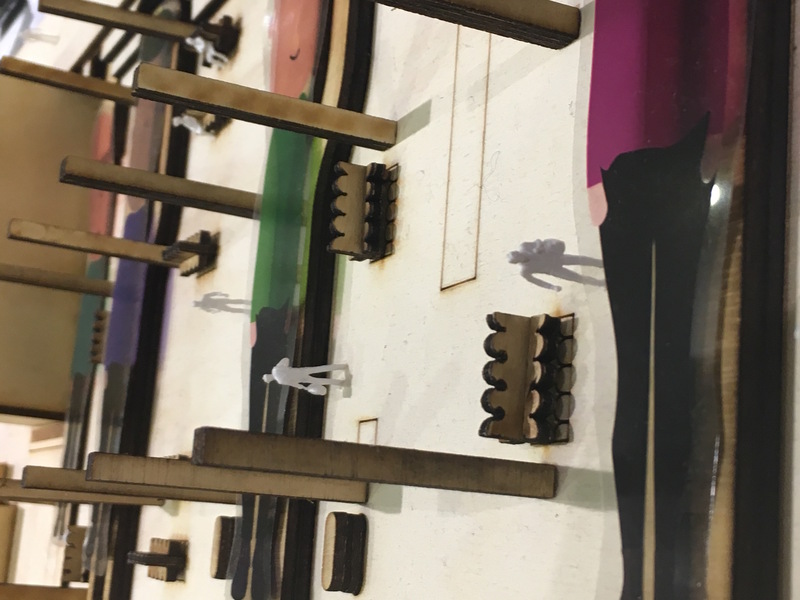 For Tomoko, the figure in the center embodies the current baggage reclaim situation : he is trapped by a web in front of the belt as the passengers. They can’t move freely as all their attention is focused constantly on the belt. Around, she displayed her ideal version of the baggage reclaim experience : passengers have a playful and relaxed moment while they still can have a look on their baggages from higher seats. 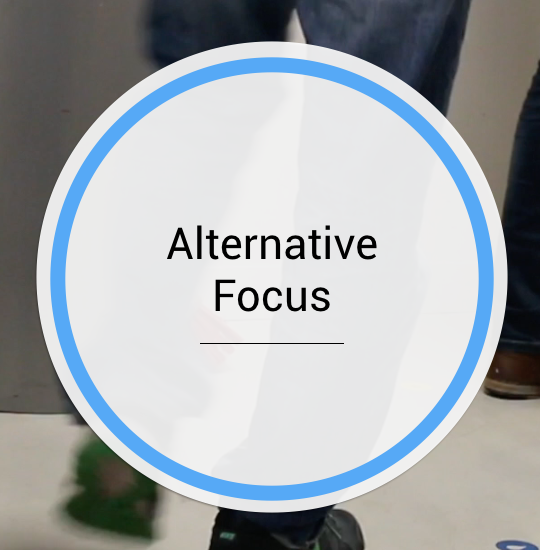 The next step was to put together all our ideal version in one setting. This step was quite complex ; we all had to make compromises to combine our ideas and propose one unique and homogeneous version. And small changes can make a big difference. 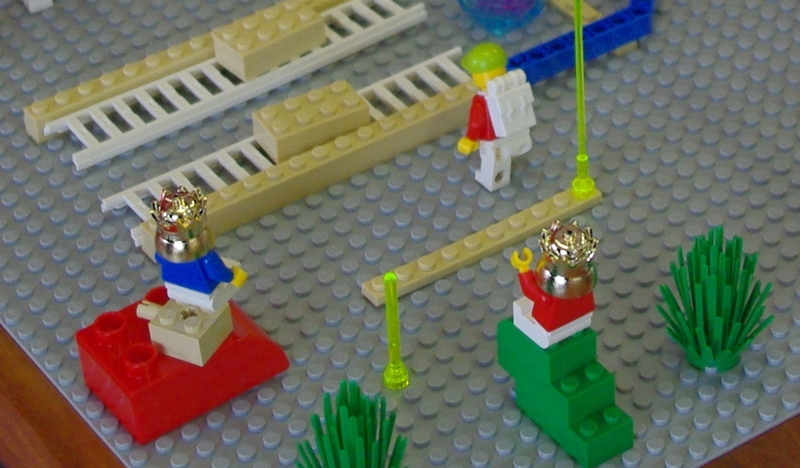 For example, by removing the crowns we put on the top of each figures and adding hat or ponytail instead, the atmosphere of the baggage reclaim changed completely. By putting crowns, we wanted to make passengers valued but at the same time, they were all looking the same and not individual anymore. With different hairstyles, we managed to make them all different and valued as an individual. We finally agreed on this last display combining all our ideals but also adding new ideas such as fluorescent pin points driving the passengers attention out of the belt and proposing an alternative and more individualized flow. We also added an after-baggage reclaim area to propose a more extended and complete version of our display. The final step was to put small green flags on each element a team member thinks he/she can add value or expertise. 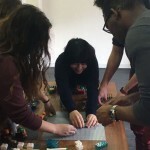 This workshop was a really nice and intense moment for our team. 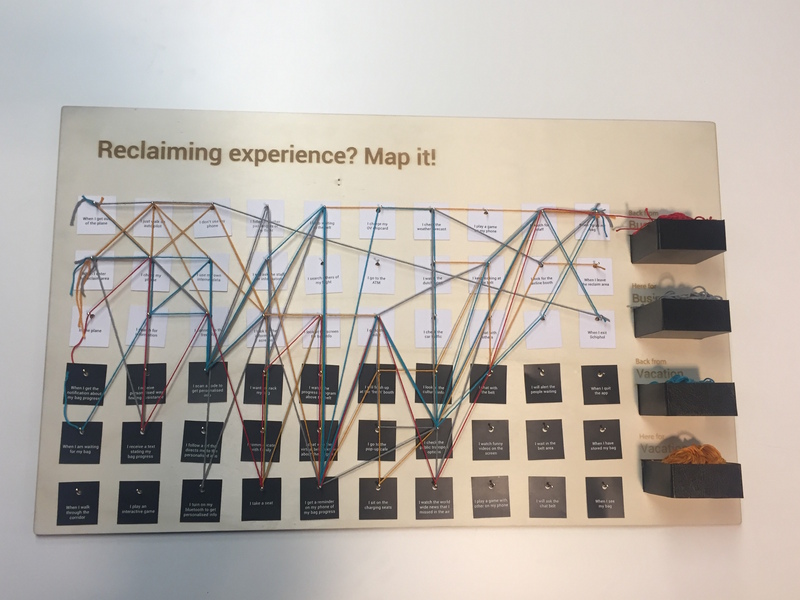 It helped us to visualize while playing how we can impact on the baggage reclaim current situation and to verbalize while making our own understanding and ideal version of the area. 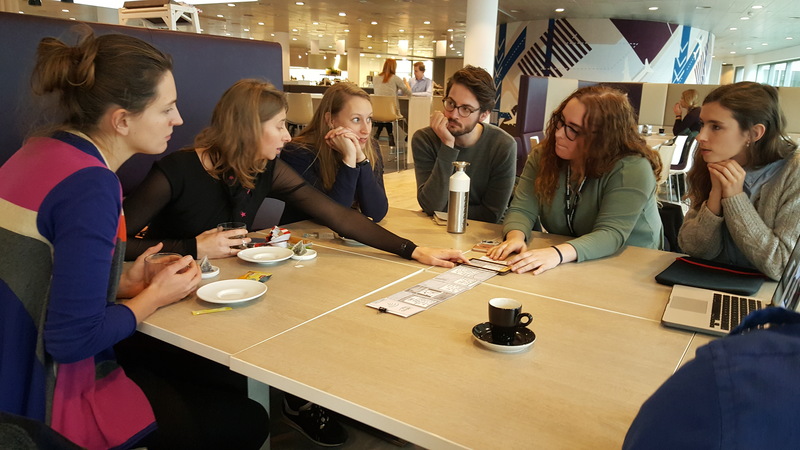 After an intense makersprint, we started our first sprint by discovering our research field : the Schiphol baggage reclaim. First by questioning what is the process the baggage has to go through until the passenger takes it home. During a visit to the baggage reclaim, where we where separated by the glass wall, we observed Arrival hall 1 & 2. To reach this goal, we needed to know on which part of the process we can make a change and which parts are untouchable. Also it was important for us to have an view of who our target group is and if we can divide them into groups. 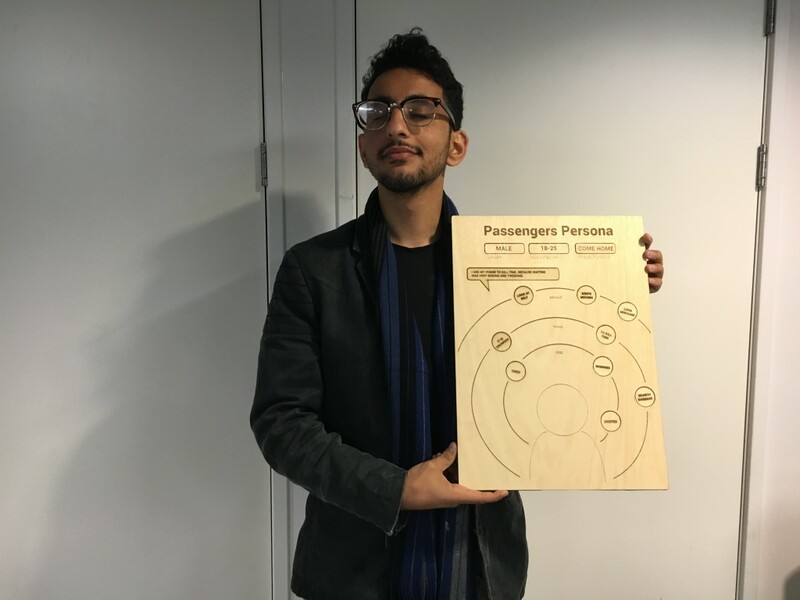 Proud of our posters, one question was resonating in our minds : Are those persona really representing the passengers ? More important, who are they really ? So, only one way to know, let’s meet them within the baggage reclaim! 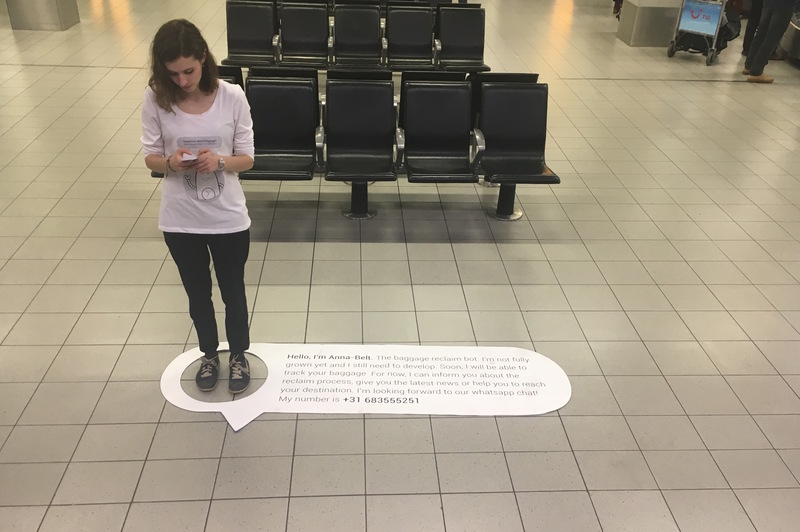 Soon after, we figured out that getting into the baggage reclaim area won’t be a piece of cake and we should find a creative way to get insights from passengers without interviewing them within the baggage reclaim and asking specific questions about Schiphol. 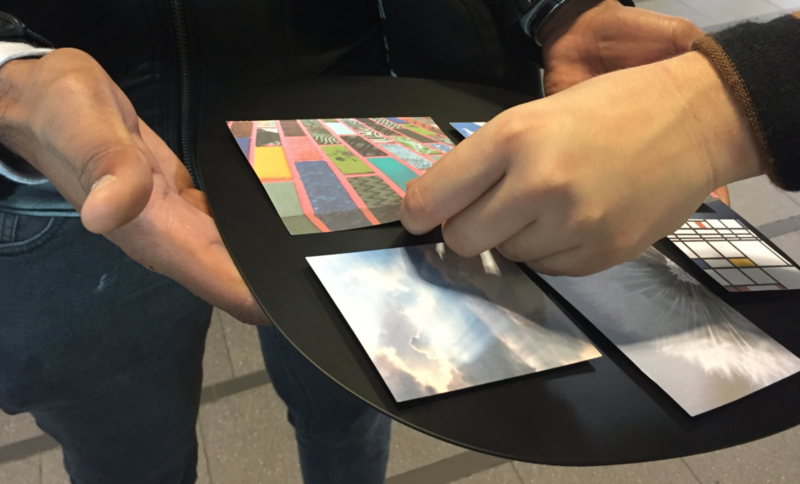 the emotion card; the players have to circle an emotion that links to their current feelings of the reclaim experience. the description card; in one word the players have to describe how they feel about the waiting in the reclaim area. With the help of these additional cards, the player reminds and documents quickly and playfully his past experience as a passenger in the baggage reclaim. 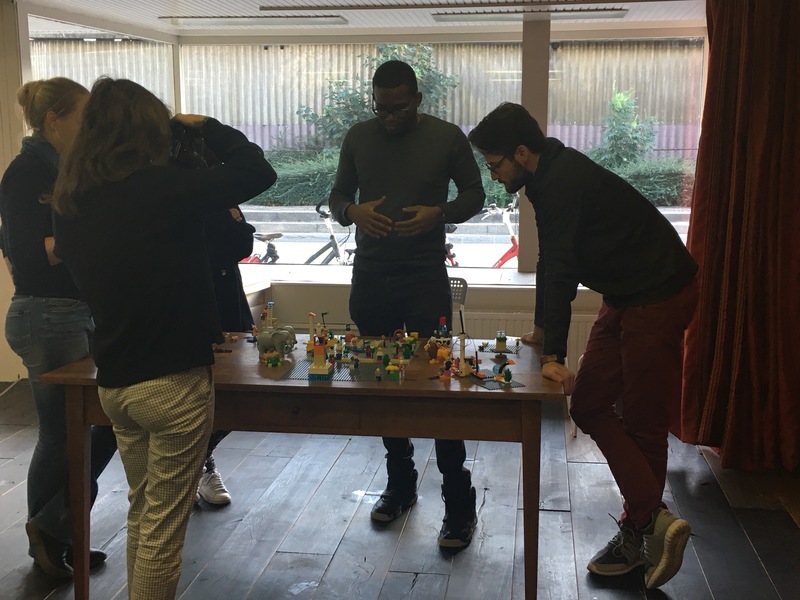 Within this makersprint we created a game for the users of our prototype to let them feel what is is like to be in the shoes of our found target groups. To challenge them to share their empathic emotions and past experiences of going through the baggage reclaim process. 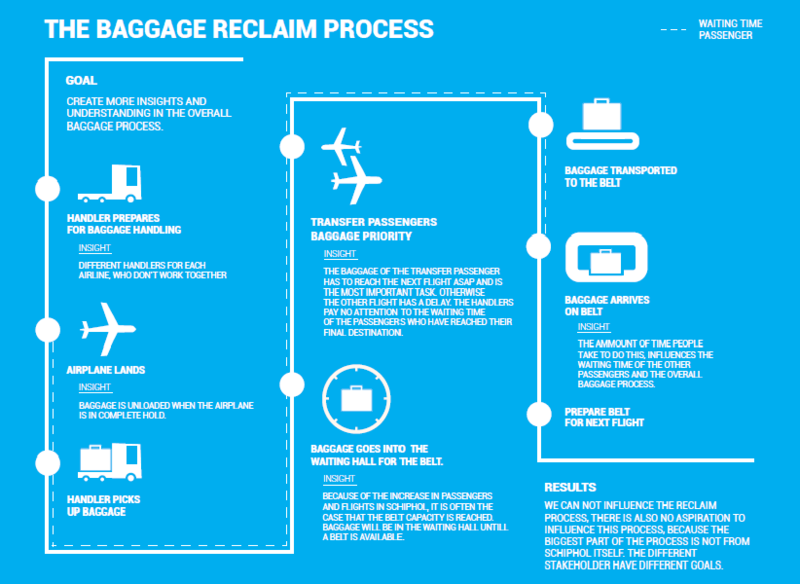 This semester we will be working on the improvement of the baggage reclaim process on Schiphol airport. 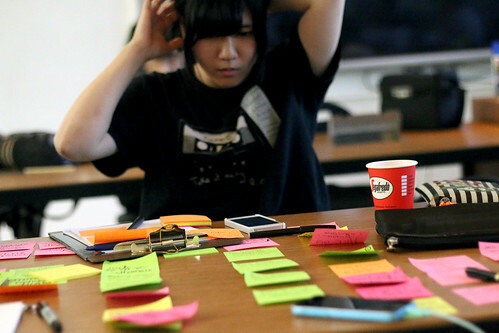 In this makersprint the goal is to get to know the available equipments and start untangling our assignment. We will be making our first prototype in just a few days. To kick it off, we started with our first team brainstorm session. By writing everything down we could come up with around the Schiphol Baggage reclaim process. 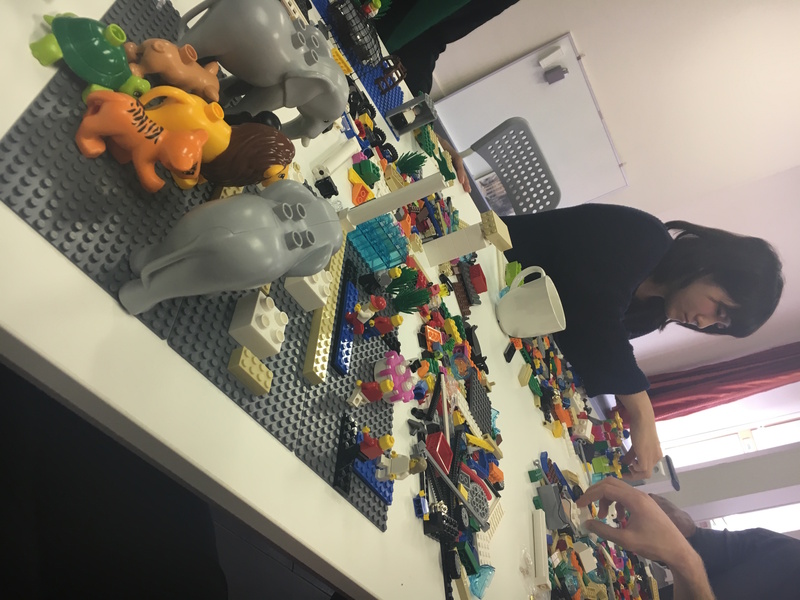 After this we discussed what we were missing and filled this up with some desk-research and customer experience reviews found online. As a next step we divided everything into categories, pinpointing the topics we could use in our the makers sprint. 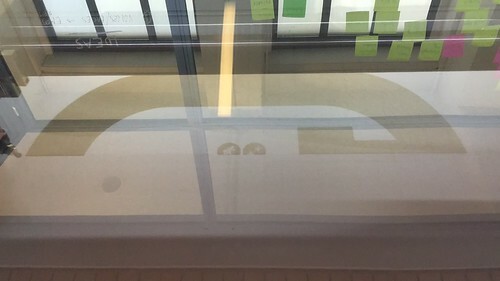 To get a clear overview we mapped it all on the window, which gave us the insight that we should focus on the user experience of the baggage reclaim process. After brainstorming, we decided to make a board game basing the rules and game personas on our found research. Classifying their purpose and situating in the placement on the gameboard. The purpose of the game is to create an opportunity to discuss the experiences in the baggage reclaim area and experience how other passengers feel in each situation. “The baggage reclaim area is like a desert. A place where no brand new inventions are around. Just simply getting your baggage and get out. It is a challenge to come up with something to make this small but important piece of travelling something to remember. It is the last part of the airport with no one but travelers, it is the last thing that still makes you a little part of the “flight world”. Broading equipment knowledge at the Makerslab. To go into the realisation process of our idea, we had to decide which equipments we’re going to use. To gain as much knowledge of the equipments as possible we made the disision to use multiple equipments each. At the end of this sprint we concluded we would take this board to the next level in our next sprint. Since it has proven itself to be a worthy method to connect ourselves to the assignment and the target group. Players really enjoyed the game and found the situations written on the card funny and close to what they have experienced.